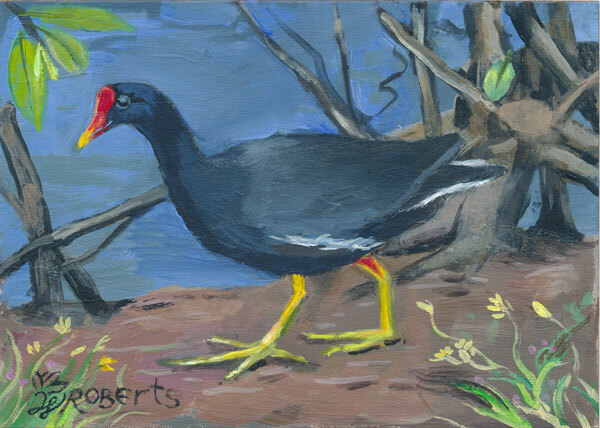 Today’s bird is a lovely little endemic Hawaiian Moorhen. I love the long brightly colored legs, extra long fancy toes, and rubbery red beak of this wading bird. They are a common sight at Hamakua Marsh next to Kailua town, but it is sadly endangered. It’s always strange to see this rare little chicken-sized bird running around so close to stores and boutiques considering its conservation status. One of its main Oahu wetlands is really close to the town center of Kailua. This bird has a lot of aliases: Hawaiian common gallinule, Hawaiian common moorhen, mudhen, and in Hawaiian it is `alae `ula (“burnt forehead” – for its prominent red frontal shield). They can be surprisingly friendly, but shouldn’t be fed by hand since many human foods (bread!) aren’t nutritious in the correct ways for birds. Java sparrows are highly social, and tend to fly in adorable little groups. 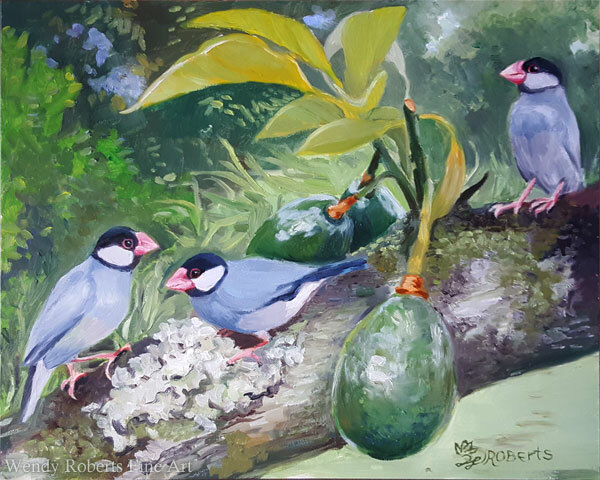 Here they are perched on the branch of an avocado tree with avocados that are just about ripe. 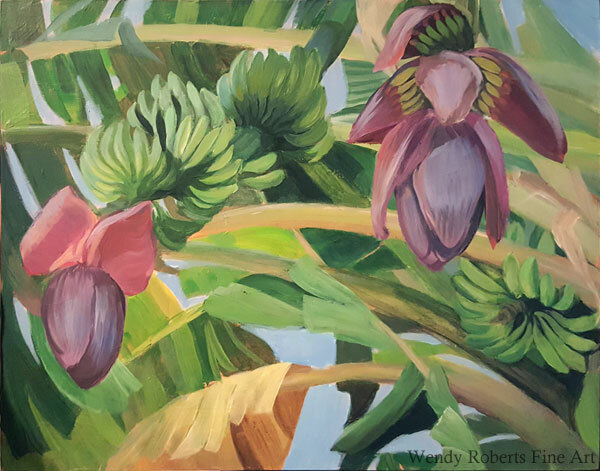 I usually work rather slowly on oil paintings, but this was one where I tried to get more comfortable with alla prima (wet in wet). I like how easy it is to soften edges, but shudder to think how long this took. 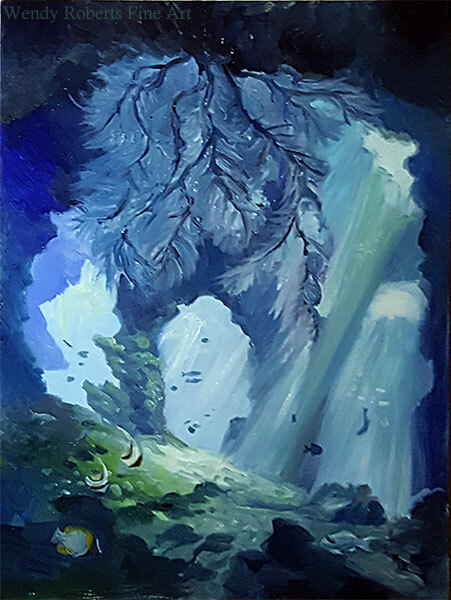 I ended up going in the second day to sharpen some details, and it took the equivalent time of 2 – 3 little paintings to get it all perfected (which makes sense because it’s twice as big too) but it was so good to return to oils after a couple of weeks of acrylics. They are so different from each other! I like them both about equally, with a slight preference for oils. 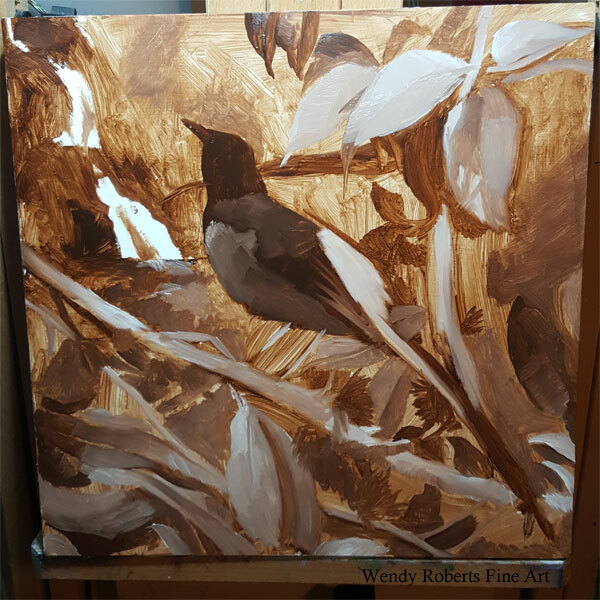 Though I realize acrylics are far superior for a challenge like this where the timing is so quick, I know I will be using oils again just to hone my alla prima direct painting technique. This leaves me wondering what to do about the extra day I missed. I painted the full usual amount of time, but because it was larger it took 2 days, and I missed one day. So do I make 29 in 30? 30 paintings for 31 days? Maybe I can squeeze 2 paintings into a day? Hmmm… we’ll see. I know the main goal of painting daily has been fulfilled regardless. If you want to see the rest of the pieces in the 30 in 30 and read more about the challenge, please visit the 30 in 30 Gallery, or view the prior blog posts. Today’s piece is another commission. 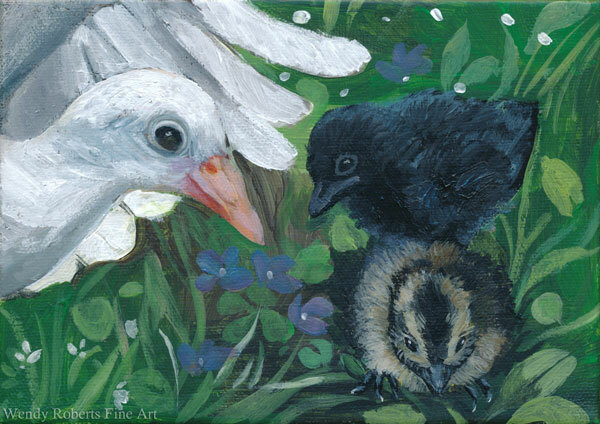 The bird rescuer who asked me to paint this triple bird portrait rescued/raised all three of these birds – two chicks and a dove. Amazingly, this pose is real. Pele is a tiny black chick who was feisty from day 1. Here, she has established the pecking order before she even has pinfeathers! I changed out a couple of things, adding some grass with little violets to the lawn and removing some cloth that wasn’t as photogenic as the birds. The dove’s wing in the original photo was blurry, so I fixed that as well. All in all it is a wonderfully quirky little portrait thanks to its unique source photo. I am happy with the results and hope she will like it as well! 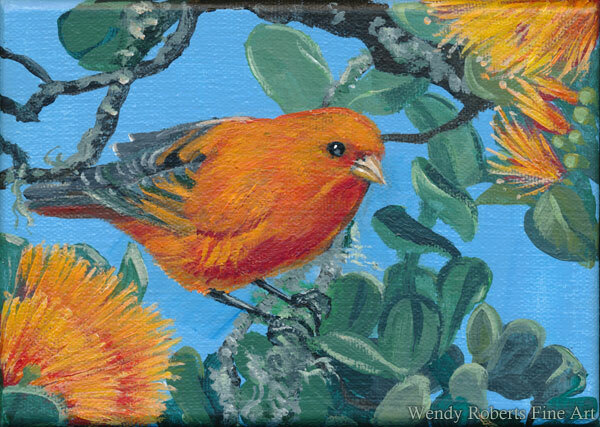 Today’s bird is a small orange honeycreeper with some of the brightest orange plumage in the world. 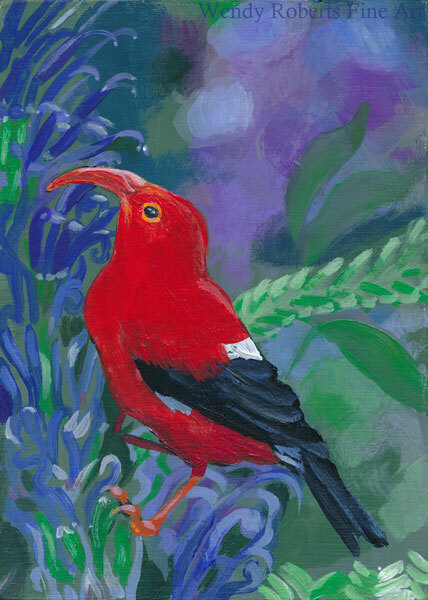 The akepa is an endemic Hawaiian bird and a rare sight currently. 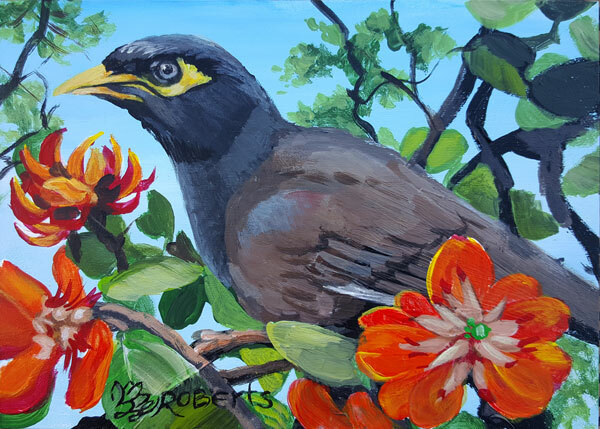 It lives in the branches of the beautiful ohia tree, an endemic Hawaiian tree with beautiful flowers of red orange or yellow which provide nectar for the small birds. Lately I have felt drawn to the orange ohia blossoms. They are a fun challenge to paint and have a peachy color as opposed to the vivid orange of the akepa. This is day 10 for me in the 30 in 30. 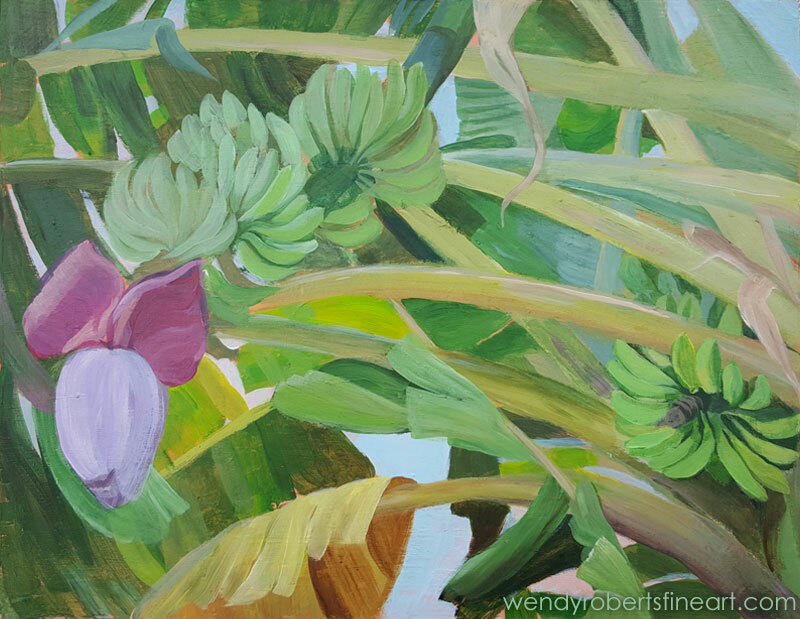 If you would like to see the other pieces I have created for this daily painting challenge, please look at my 30 in 30 Gallery. 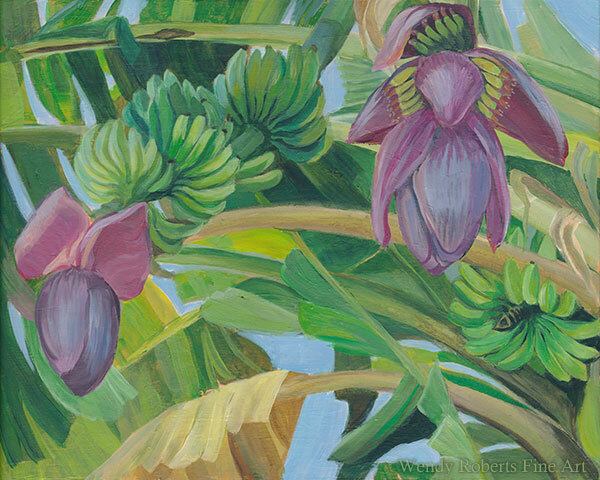 This painting is available for online purchase. If you are buying more than one, or need to arrange shipping to an International destination, please contact me and I can send a custom invoice that will account for accurate shipping costs.